Transcription—the reading of a segment of DNA into an RNA template for protein synthesis—is fundamental for nearly all cellular processes, including growth, responding to stimuli, and reproduction. Now, Whitehead Institute researchers have upended our understanding of how transcription is controlled and the role of transcription factors in the process. The paradigm shift, described in an article online on Dec. 7 in the journal Cell, hinges on a small protein that plays a key role in genome structure and gives us new insights into how changes in the control of transcription and gene expression can lead to disease. Transcription has several important players that must all be in the right place at the right time: the transcription machinery, transcription factors, promoters, and enhancers. According to the existing model, transcription factors are proteins that bind to enhancer regions of the genome and recruit the transcription machinery to the promoter DNA regions, which then initiate the genes' transcription. "We've always assumed that the role of transcription factors was to recruit the transcription machinery to genes to turn them on or turn them off," says Richard Young, a Whitehead Insistute member and professor of biology at MIT. "But we never imagined that the transcription factors we've studied for three decades actually contribute to the genome's structure. And as a consequence, they regulate genes. So we now look at genomes like proteins: They have to fold up appropriately in order to control genes." Scientists have known that the genome's structure—how it bends and folds—is essential for efficiently compressing two meters of DNA into each human cell, which is the equivalent of packing a strand ten football fields long into a space the size of a marble. Yet until recently, researchers have not had the tools necessary to appreciate this architecture's importance in fine control of gene expression or study the genome's structure at sites ready for transcription. 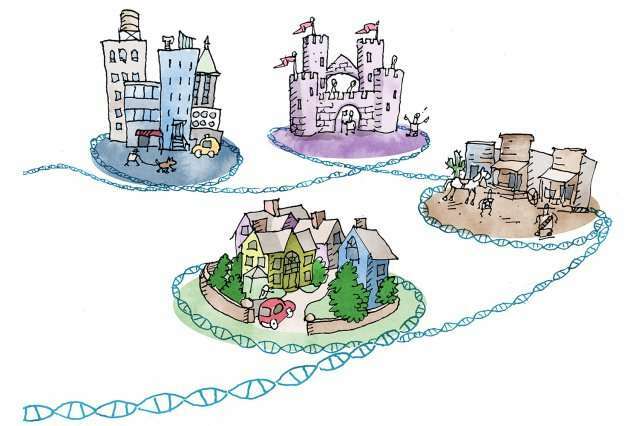 In 2014, Young and his lab determined that portions of the genome reside in loop-based structures, creating insulated neighborhoods that bring enhancers, promoters, and genes into close proximity. Each loop is tied at the top by a pair of molecules, called CTCF, that are bound together. This structure is essential for proper gene control: If the loop structure is broken, gene expression is altered, and cells can become diseased or die. In the current research, Young along with co-first authors Abraham Weintraub and Charles Li took a closer look at a protein that is well known but not well understood: Yin Yang 1 (YY1). Hundreds of scientific papers have linked YY1 dysfunction to diseases such as viral infections, cancer, and arthritis, and yet the studies produced seemingly contradictory observations of YY1's function. According to Young and colleagues, YY1 is a unique transcription factor that occupies both enhancers and promoters, is essential for cell survival, and is found in almost every cell type in humans and mice. Like CTCF, YY1 can also pair with itself and bind to DNA to form loops that enhance DNA transcription. "YY1 is expressed broadly, and it is necessary for establishing enhancer-promoter loops in multiple cell types," says Weintraub. "That's its job, not recruiting the transcription apparatus. When the structure created by YY1 is removed, the genome is no longer folded properly, gene control is lost and transcription of the affected genes is significantly diminished, which can cause dysfunction." This model of YY1's function could account for its association with a number of disparate diseases. Earlier this year, scientists reported YY1 syndrome—a genetic syndrome causing cognitive disabilities in people with mutations in their YY1 gene. According to Young, YY1 is probably not the only transcription factor with this loop-forming role, and his lab will be searching for additional factors with similar functions. "YY1 is most likely just the first one, and there are probably a bunch of collaborators that have similar roles," says Young. "Instead of the classic function that we thought these transcription factors had—interacting with the transcription apparatus and giving instructions on how much or how little of a gene's transcript to produce—they are bringing together regulatory elements with the gene. The whole job of these transcription factors is just making structure. We are realizing that the things that form physical structures are much more important than we had appreciated."